I am pleased to say that we now have stocks of several of the new stamps and booklets, which can be found on our webshop as 'Recent Additions' and in the 2018 Definitives and Booklets categories. Latest news on the Walsall printing of counter sheets - and this is by no means final news - is that Royal Mail intend, as they did on 23 May, to distribute all the new printings to standing order customers for non-visible changes in September. 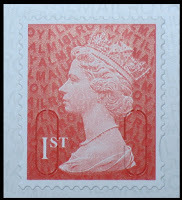 Rather than issue single stamps as they become available, which is uneconomic for them even if they charge 45p to send customers a 2p stamp, the 1p, 2p, 5p and 2nd class Large counter sheets will be distributed coinciding with the Autumn Stampex issues (World War I and Post and Go). As readers have reported the 2p is widely available in Post Office branches up and down the country, and may have been available briefly from Tallents House in error. We will list the 2p as soon as we can find a local post office that has stock, and the other values as they become available. Indications are that current Post Office and Royal Mail stocks of some values are sufficient for a reprint to be delayed until at least August. Time will tell. Because of attendance at Stafford Stamp Fair and Philanglia there will be some delay in despatching orders of these new stamps. I am wondering that, if they are reprinted this year, the Recorded Signed for values & Special Delivery values will be classed as NVC and sent out to customers with standing orders for such issues, another wait and see project. I have just received my 2018 Gibbons Concise, and have noticed that there is another new 5p stamp from a PSB it is from DY25 Royal Air force Centenary , new because the 'P' in MPIL is missing, the SG code for this is 3072f, I never noticed this . Just checked the other 2 stamps from that PSB pane with my Concise & the other stamps 2p & £1.17 are the same with the missing 'p'. Corresponding SG numbers are SG3071d & SG3084a.